Up to this point, Jordan Peele has been most notable for the sketch comedy series Key & Peele and last year’s so-so comedy Keanu but he’s clearly stepped up his game in a big way for his directorial debut. 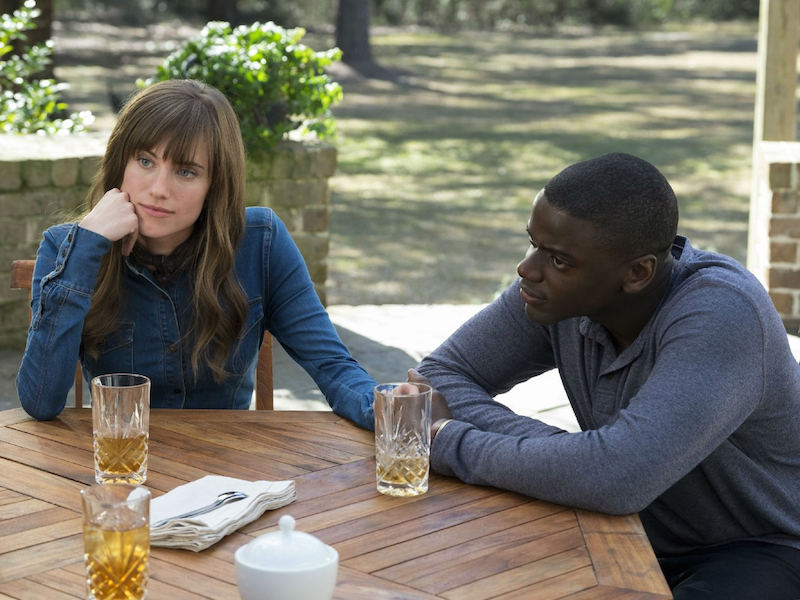 Get Out is my favorite kind of horror movie: one that mines the small anxieties and absurdities of everyday living to create an increasingly feverish nightmare scenario that paradoxically feels more plausible as it gets stranger. What’s more, it has a tongue-in-cheek perspective on modern race relations that most major studios would try to shy away from or push to the side but this film uses to create something that’s both timely and trailblazing. British actor Daniel Kaluuya, who starred in my favorite episode of Black Mirror, plays Chris, a talented black photographer who has been dating his girlfriend Rose (Allison Williams) for a few months and finds that the time has come for a weekend trip to meet her family. Aside from the typical nerves that arise from meeting a significant other’s parents for the first time, Chris worries that Rose hasn’t told her white family that she’s dating a black man, even though she can’t imagine her liberal parents (Bradley Whitford and Catherine Keener) having any issues with their relationship. All seems to be going well during the initial meet-up but as time progresses, an unplaceable tension gives way to creepy behavior and a sense that something sinister may be afoot. Not only is the acting in Get Out uniformly fantastic but the casting of each character (with one glaring exception) is spot-on in both major and minor roles. Kaluuya’s unassuming mannerisms are a perfect fit for a character that endures increasingly bizarre circumstances and Williams brings layers of depth to a role that seems similar to the one she plays in the HBO series Girls but proves to have much more going on under the surface. There’s even some hilarious comic relief in the form of comedian Lil Rel Howery, who’s often an audience surrogate and the voice of reason against the abnormal twists that develop as the plot progresses. Peele is markedly assured as a first-time director; he knows just how far to take each scene and is so skilled at playing with the expectations and empathies of his audience. He also addresses racism in admirably nuanced fashion, not settling for easy targets and low-hanging fruit but instead exposing the condescension and tactlessness that can occur in communication between black people and even the most well-intentioned of white people. The film’s best scene documents a barrage of these types of interactions, in which privileged partygoers are eager to engage with Chris about his superior physique and the greatness of Tiger Woods (even though Chris mentions that he’s not a golf fan). Aside from the racial commentary, the film works on its own terms as a ruthlessly efficient thriller that expertly ratchets up the tension and diffuses it in ways that are sometimes funny, sometimes scary but always surprising. The influence of directors ranging from Spike Jonze to Michael Haneke is evident from details that pop up in the costume design and the visual effects, which indicates that Peele clearly did his homework when crafting his project. I’ll no doubt pick up on more of these embedded elements during the inevitable repeat viewings that I have for Get Out, one of the finest achievements of the horror genre in the 21st century.